The oral administration is the preferred route of drug administration due to its convenience, good patient compliance and low production costs. For complete drug absorption into the systemic circulation following oral administration, the drug must be dissolved in the gastric fluids. As a result, poor water-soluble drugs show erratic and incomplete absorption from the gastrointestinal tract, leading to the therapeutic failure. Therefore, it is necessary to enhance dissolution of these drugs to ensure maximum therapeutic efficacy ,, . The dissolution rate of a drug is directly related to its solubility as per Noyes-Whitney equation and therefore solubility of a drug substance is a major factor that controls its dissolution rate, absorption, and bioavailability , . Albendazole (ABZ) is a benzimidazol derivative with a broad spectrum of activity against human and animal helminth parasites used in the treatment of echinococcosis, hydrated cysts, and neurocysticercosis. On the other hand, ABZ is a poorly water soluble drug and consequently is poorly absorbed from the gastrointestinal tract. Another major disadvantage for the systemic use of ABZ is the low (5%) oral bioavailability  . Different efforts have been made to enhance solubility and dissolution rate of ABZ such as preparation of oil in water emulsion, incorporation into liposomes, complexation with cyclodextrins, and preparation of solid dispersions , . However, these methods suffer from complexity, time consuming preparation process, high cost, and unsuitability for industrial scaling up. Spray drying is a simple, economical, and industrially used method for the preparation of a dry powder directly from a liquid. This method takes the benefits of reduced labor, equipment costs, space requirements and possible contamination of the product , . Therefore, the aim of the present study was to improve the solubility and dissolution rate of ABZ by using spray drying technique utilizing various classes of hydrophilic excipients such as sugars (lactose, sucrose, and glucose), polyols (mannitol and sorbitol), ionic surfactant (sodium lauryl sulfate (SLS)) and non-ionic surfactant (Cremophor A25). Albendazole was supplied from Jintan Zhongxin Pharmaceutical Company (China). Mannitol and sucrose were obtained from Fluka (Switzerland). Lactose, glucose, sorbitol, glacial acetic acid, and SLS were purchased from Merck Chemicals (Germany). Cremophor A25 was prepared from Sigma-Aldrich (Germany). The mixture solutions of glacial acetic acid and water (1:1 v/v), containing excipients and drug were fed into the nozzle via a peristaltic pump sprayed at flow rate of 8 mL/min with the compressed air force of 75 L/h using a mini spray dryer (B-290, Büchi, Switzerland). The solvents in the droplets were evaporated in drying chamber by the blown hot air (inlet and outlet air temperatures were set at 130 °C and 83 °C, respectively). The dried products were collected in collection vessel, weighed and kept in tightly closed container in the desiccator. The powder production yield was between 32-51% for different formulations. The content uniformity of prepared powders was investigated by dissolving 50 mg of powders in 10 mL glacial acetic acid. Solubility measurements were performed five times using saturation shake flask method. Excess quantities (20 mg) of the pure ABZ and formulations (containing an equivalent amount of 20 mg of ABZ) were dissolved in 2 mL of 0.1 N hydrochloric acid and stored in sealed micro tubes for 3 days at 37 ± 0.5 °C. Subsequently the solutions were centrifuged for 30 min at 14,000 rpm and supernatant was analyzed by a UV spectrophotometer 160A (Shimadzu, Kyoto, Japan) at 230 nm. Drug release studies were performed by USP type II apparatus for 90 min in 0.1 N hydrochloric acid (37 ± 0.5 °C) at 50 rpm according to US pharmacopeia (USP) recommendation  . Formulations equivalent to 200 mg of pure ABZ were filled in hard gelatin capsules. Samples (2 mL) were taken at the predetermined time intervals from the dissolution apparatus chamber, centrifuged for 15 min at 14,000 rpm and subsequently, the concentration of ABZ in supernatant was assayed spectrophotometrically at 230 nm using a pre-constructed calibration curve which was linear in the range of 2-40 µg/mL with an r 2 of 0.9998. Fresh and pre-warmed dissolution medium (2 mL) was replaced immediately. Cumulative percentage of released drug versus time was plotted for the prepared solid dispersions as well as unprocessed and spray dried ABZ. Experiments were conducted in triplicates and the mean values were reported. A model-independent approach, dissolution efficiency (DE%), and a USP recommended time point approach namely the percentage of drug released at 30 min (F 30min ) were used to compare drug release profiles. Higher dissolution rate results in higher DE% and F 30min values. The DE% was computed to compare the relative performance of various type and concentrations of excipients in the investigated formulations. The DE% of a solid dispersion is defined as the area under the dissolution curve up to a certain time, t, expressed as a percentage of the area of the rectangle described by 100% dissolution at the same time. The DE% can be calculated from following equation  . where, Y is the percent drug dissolved at time t. Prior to the dissolution study, the content uniformity of prepared powders was investigated by dissolving 50 mg of powders in 10 mL glacial acetic acid and properly dilution with HCl 0.1 N to assay drug content by UV spectroscopy method. The experiment was done at least in triplicate. The flowability of formulations was assessed by determination of angle of repose (AOR). The powders flow through funnel orifice slowly and constantly onto a horizontal surface and the angle of the resulting pyramid was measured  . The X-ray diffraction (XRD) and differential scanning calorimetric (DSC) patterns of pure drug, excipients, physical mixtures, and formulated solid dispersions were determined using the X-ray diffractometer (D500, Siemens, Germany) and DSC TA 60 (Shimadzu, Japan), respectively to investigate any possible change in the crystallinity of ABZ. Diffractograms were run at scanning speed of 2 °C/min and a chart speed of 0.022 °C/min over 2-θ scale range of 2 °C to 70 °C. Samples in DSC analysis were heated in the aluminum disc over the range of 30-300 °C at the rate of 30 °C/min under nitrogen atmosphere. DSC spectra were recorded using TA 60 W software. The possible drug-excipient interaction was explored using fourier transform infra-red (FTIR) spectrophotometer (MB-100, Bomen, Canada). Ten mg of samples was mixed with KBr and scanned over a frequency range 400-4000 cm -1 . 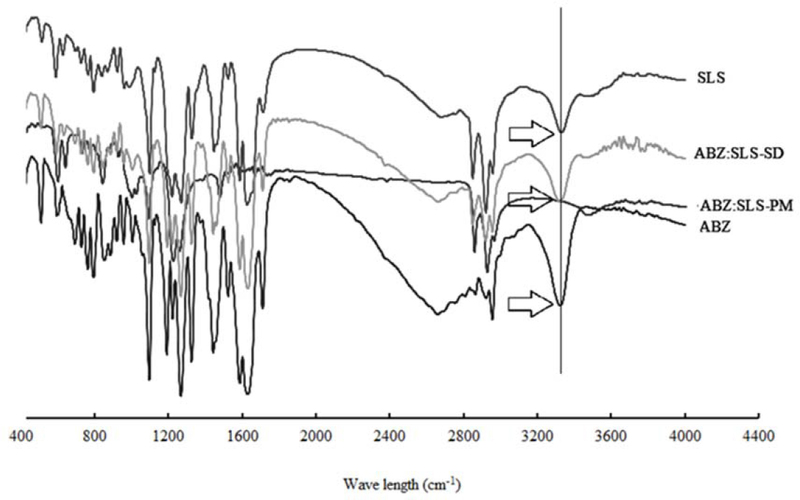 FTIR spectra were obtained at a resolution of 4 cm -1 with a minimum of 256 scan per spectrum. All measurements were taken at room temperature. An empty KBr disk was used as reference and its spectrum was subtracted from the sample spectrum to suppress the spectral artifacts caused by KBr impurities and water. The particle size and size distribution of the prepared solid dispersions were determined using the laser diffraction particle size analyzer Sald 2101 (Shimadzu, Japan) equipped with the Wing SALD software V. 2101. The excess and saturated amounts of pure drug powder and solid dispersed form of ABZ were dispersed in water and mean diameter and size distribution of the resulted homogeneous suspension were assessed. Each mean value resulted from triplicate determinations. The shape and surface morphology of the particles were studied by the scanning electron microscope 1430 VP (LEO, UK & Germany). Prior to scanning, the samples were coated with a thin layer of gold, using a direct current sputter technique 450X (Emitech-k, England). The data are reported as mean ± SD (n = 3) and statistical analysis of the data was carried out using one-way ANOVA followed by Tukey's HSD (honest significant difference) test. P-values less than 0.05 was considered significant. Solubility studies showed that spray drying of ABZ resulted in approximately 2 folds increase compared to the solubility result of pure ABZ. 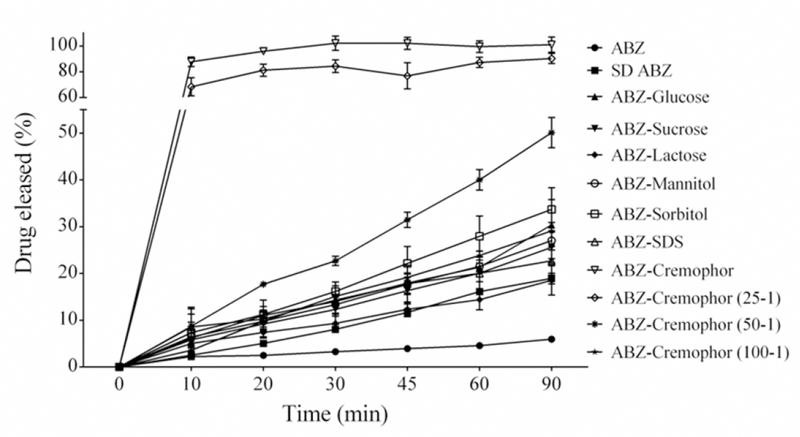 Addition of mannitol, sorbitol, glucose, sucrose, and lactose to the spray-dried ABZ formulations did not further improve the solubility of ABZ [Table 1]. Surprisingly, SLS not only could not improve the solubility of ABZ, but also reduced the solubility of unprocessed ABZ. On the other hand, other surfactant, Cremophor A25 showed the highest impact on the ABZ solubility enhancement. Even decreasing the Cremophor/drug ratio to 1/100 could increase the ABZ solubility up to almost 2 folds [Table 1]. The dissolution study results indicated that spray drying of ABZ itself and co-spray drying with all explored excipients exhibited significant (P < 0.05) improvement in the dissolution parameters (DE and F 30min percent) of ABZ almost in the same level, however, the increased solubility in the case of formulations containing Cremophor A25 was more notable [Figure 1]. Results of angle of repose measurement showed that spry drying of ABZ caused an increase in the angle of repose and consequently a decrease in flowability of the powder. Furthermore, among the investigated excipients, only SLS, glucose, and Cremophor A25 (at ratio of 1:1) showed better flow characteristics after spray drying [Table 1]. Results of particle size analysis indicated that there was not significant change in the size of particles after spray-drying (ranged between 8.6 to 11.2 µm). SEM images indicated the rod shape for unprocessed drug crystals [Figure 2]a and spherical drug particles with a few degrees of aggregation for spray dried powders [Figure 2]b. The incorporation of Cremophor A25 greatly changed the morphology of spray dried powder [Figure 2]c by production of roughly surfaced spherically shaped particles. [Figure 3] shows the diffraction pattern of unprocessed ABZ, spray-dried ABZ as well as physical mixture and spray-dried ABZ with SLS, lactose, and Cremophor A25. XRD analysis demonstrated a change in the drug crystallinity. The diffraction pattern of unprocessed drug showed high degree of crystallinity as evidenced by a few peaks with high intensity. However, in the case of spray-dried ABZ, some of sharp peaks (2θ = 19.4, 20.4 and 22) were disappeared and intensity of remained peaks was substantially decreased (2θ = 6.8, 11.2, 17.8, 24.5, and 27.1). [Figure 4] shows the DCS thermograms of ABZ, SLS, lactose, as well as their physical mixtures and spray-dried formulations. Melting points and melting enthalpy of unprocessed ABZ and spray-dried ABZ were 222.26 °C, 204.46 J/g and 219.8 °C, 190.27 J/g, respectively, indicating a decrease by spray drying process. Co-spray drying of ABZ with lactose and sucrose resulted in almost the same reduction in enthalpy of ABZ as drug spray drying without any additive. Co-spray drying of ABZ with mannitol, sorbitol, and glucose concluded a more reduction in ABZ enthalpy than drug spray drying without any additive [Table 2]. The FTIR experiment was carried out to assess the possible hypothesized ABZ-SLS interaction. [Figure 5] shows the FTIR spectroscopy of unprocessed ABZ, SLS, and their physical mixture and spray-dried formulation. 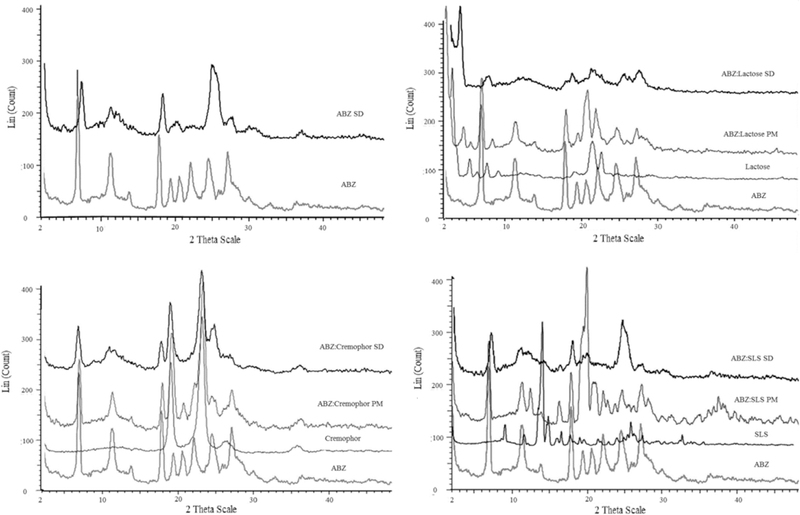 As shown in [Figure 5], the peaks of amine and sulphate groups associated to ABZ and SLS in co-spray dried ABZ with SLS were shifted from 3325 to 3444 and 1185 to 1208 cm -1 , respectively. The FTIR experiment did not show any possible interaction between drug and the rest of excipients which was predicted due to lack of active functional groups on the sugars, polyols, and non-ionic surfactants. Solid dispersions have attracted extensive interest as a proficient tool of enhancing dissolution rate and hence the oral bioavailability of various poorly water-soluble drugs. Spray drying is also a simple and one-step technique with low cost and labor and fast to prepare solid dispersion. As shown in [Figure 1] and [Table 1], Cremophor A25 improved all dissolution indexes of ABZ dramatically even in the lower amounts (ABZ:Cremophor, 25:1). This finding motivated us to co-spray ABZ with lesser amounts of Cremophor A25 (ABZ:Cremophor,50:1). Although, this formulation resulted in the highest dissolution indices among all the excipients which were co-spray dried with ABZ in much higher amounts (ABZ:excipient, 1:1), the dissolution enhancement results was not as efficient as ABZ:Cremophor, 25:1 formulation. Increasing the amount of Cremophor (ABZ:Cremophor = 100:1) did not result in greater solubility and same improvement as other excipients was observed. Therefore, spray drying specially by using Cremophor A25 (even with very low amounts) increased the solubility and dissolution rate of ABZ simultaneously. Improved particle wetting by adding small amount of surfactant may be responsible for observed results in the present study  . The main mechanisms through which spray drying technique improve solubility and dissolution rate of drugs are a decrease in particles size and crystalline degree of the drugs  . Spray-dried formulation containing SLS showed lower solubility than all formulations prepared with other excipients and even unprocessed drug which could be attributed to the interaction of sulphate moiety in SLS and amine group in ABZ [Figure 5]. In the present study, the particle size of unprocessed and spray-dried ABZ did not differ significantly which indicated that the improvement of solubility and dissolution parameters was not due to particle size reduction. The reduction of particle size could be one of the reasons for improved solubility  . Therefore, change in crystalline degree of ABZ played the key role in dissolution behavior of the formulations. The major drawbacks associated with spray-dried powders of reduced degree of crystallinity are their instability. By moisture absorption, phase separation, crystal growth or a change from metastable less crystalline to stable crystalline form can occur which results in the reduction of drug solubility on aging  . Therefore, special anti-moisture pharmaceutical packages would highly recommend for dosage forms formulated by proposed method in the present study. It is noteworthy to mention that the presence of surfactant in our developed and optimized formulation may overcome the instability problem. It was reported that the addition of surfactants in the solid dispersions may help to prevent drug recrystallization and to stabilize the systems , . Incorporation of highly water soluble excipients in solid dispersions always enhances the chances of crystallization due to water uptake characteristics when comes in contact with the aqueous gastrointestinal fluids. Surfactants such as Cremophor A25 have been introduced as inhibitors of recrystallization after drug administration  . 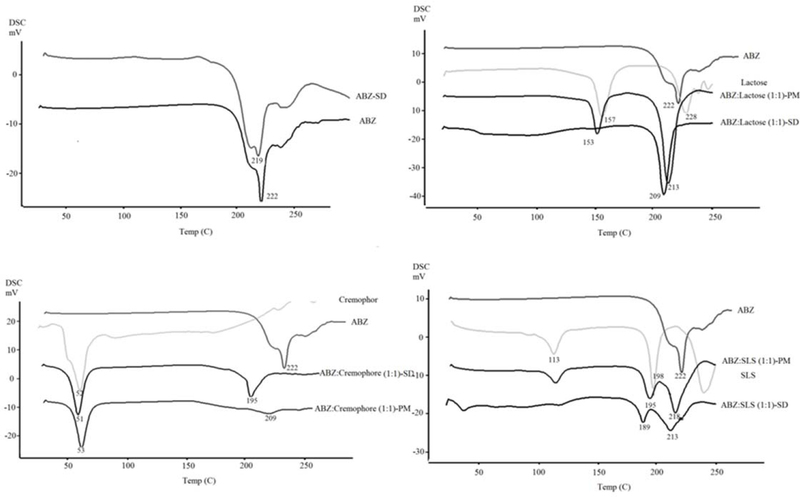 Results of the XRD study of co-spray dried formulations with mannitol, sorbitol, sucrose, and glucose indicated same change in the crystallinity of ABZ after spray drying (data are not shown). The enthalpy values of powders produced by co-spray drying of ABZ with SLS and Cremophor A25 were reduced dramatically, indicating the great change in crystallinity of ABZ structure during spray drying process [Table 2]. Interestingly, the change in enthalpy of ABZ was well-matched with the change in DE index implying that powder crystallinity played the main and solely role in improvement of dissolution rate of ABZ. The formation of ionic complex between SLS and ABZ and its molecularly distribution in the co-spray dried formulation may be responsible for observed low enthalpy [Table 2] and consequently low crystalline habit of ABZ co-spray dried powder. But this reduction in ABZ crystallinity did not help the ABZ dissolution because addition of long carbonic chain as a hydrophobic anchor to the ABZ structure reduced its dissolution dramatically. The flow properties of formulations showed that spray-drying worsen the flowability of ABZ from passible range (AOR = 41- 45) to poor range (AOR = 46-55)  . It is proposed that further experiments with addition of glidants and lubricants will be performed for improving powder flow. SEM images were used to interpret the flow characteristics of powders. The rod shape unprocessed drug crystals prevented powder accumulation and attachment [Figure 2]a. On the other hand, spray drying caused the formation of spherical drug particles with a few degrees of aggregation [Figure 2]b. The incorporation of Cremophor A25 greatly changed the morphology of spray dried powder [Figure 2]c by production of rough surface spherically shaped particles. The SEM images were well matched with improvement or deterioration of powder flowability of ABZ by spray drying with Chromophore A25 and other excipients, respectively. ABZ, a drug with very low solubility, were co-spray dried with different hydrophilic excipients to improve its solubility and dissolution rate. Spray drying of ABZ without excipient also increased its solubility and dissolution rate. Among different type of excipients (polyols, sugars, anionic, and non-ionic surfactants), Cremophor A25 resulted in significant improvement in solubility even when very low amount was utilized. The DSC studies showed that change in drug crystallinity played the most important role in dissolution enhancement of ABZ. In this study, Cremophor A25 is introduced as a valuable excipient for improvement of dissolution rate of poorly soluble drugs (classe II and IV drugs of BCS) by simple, industrially scalable, one step, and cost-effective spray drying technique. Rasaie S, Ghanbarzadeh S, Mohammadi M, Hamishehkar H. Nano phytosomes of quercetin: A promising formulation for fortification of food products with antioxidants. Pharm Sci. 2014;20(3):96-101. Abbaspour M, Jalayer N, Sharif Makhmalzadeh B. Development and evaluation of a solid self-nanoemulsifying drug delivery system for loratadin by extrusion-spheronization. Adv Pharm Bull. 2014;4(2):113-119. Dizaj SM, Vazifehasl Zh, Salatin S, Adibkia Kh, Javadzadeh Y. Nanosizing of drugs: Effect on dissolution rate. Res Pharm Sci. 2015;10(2):95-108. Khadka P, Ro J, Kim H, Kim I, Kim JT, Kim H, et al. Pharmaceutical particle technologies: An approach to improve drug solubility, dissolution and bioavailability. Asian J Res Pharm Sci. 2014;9(6):304-316. Yehia SA, El-Ridi MS, Tadros MI, El-Sherif NG. Enhancement of the oral bioavailability of fexofenadine hydrochloride via Cremophor® El-Based liquisolid tablets. Adv Pharm Bull. 2015;5(4):569-581. Garcýìa JJ, Bolás F, Torrado JJ. Bioavailability and efficacy characteristics of two different oral liquid formulations of albendazole. Int J Pharm. 2003;250(2):351-358. García A, Barrera MG, Piccirilli G, Vasconi MD, Di Masso RJ, Leonardi D, et al. Novel albendazole formulations given during the intestinal phase of Trichinella spiralis infection reduce effectively parasitic muscle burden in mice. Parasitol Int. 2013;62(6):568-570. Pensel PE, Castro S, Allemandi D, Bruni SS, Palma SD, Elissondo MC. Enhanced chemoprophylactic and clinical efficacy of albendazole formulated as solid dispersions in experimental cystic echinococcosis. Vet Parasitol. 2014;203(1-2):80-86. Rahimpour Y, Hamishehkar H. Lactose engineering for better performance in dry powder inhalers. Adv Pharm Bull. 2012;2(2):183-187. Dixit M, Kini AG, Kulkarni PK. Preparation and characterization of microparticles of piroxicam by spray drying and spray chilling methods. Res Pharm Sci. 2010;5(2):89-97. Hurtado y de la Peña M, Vargas Alvarado Y, Domínguez-Ramírez AM, Cortés Arroyo AR. Comparison of dissolution profiles for albendazole tablets using USP apparatus 2 and 4. Drug Dev Ind Pharm. 2003;29(7):777-784. Safari S, Zarrintan MH, Soleimani M, Dorkoosh FA, Akbari H, Larijani B, et al. Evaluation and optimization of chitosan derivatives-based gene delivery system via kidney epithelial cells. Adv Pharm Bull. 2012;2(1):7-16. Maghsoodi M, Hemati E, Qadermazi B, Yari Z. Hollow microspheres for gastroretentive floating-pulsatile drug delivery: preparation and in vitro evaluation. Adv Pharm Bull. 2011;1(2):55-61. Wong SM, Kellaway IW, Murdan S. Enhancement of the dissolution rate and oral absorption of a poorly water soluble drug by formation of surfactant-containing microparticles. Int J Pharm. 2006;317(1):61-68. Nuzzo M, Millqvist-Fureby A, Sloth J, Bergenstahl B. 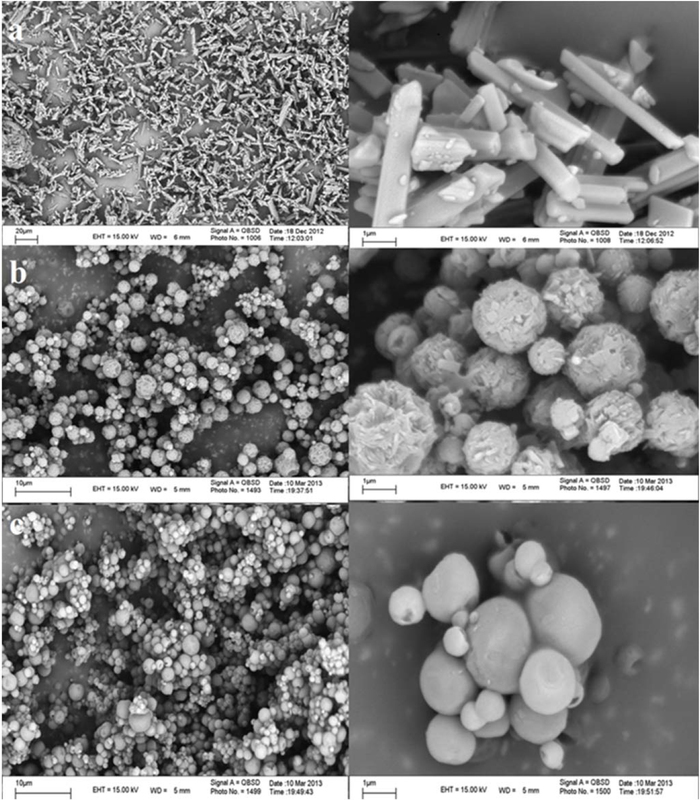 Surface composition and morphology of particles dried individually and by spray drying. Drying Technol. 2015;33(6):757-767. Leuner C, Dressman J. Improving drug solubility for oral delivery using solid dispersions. Eur J Pharm Biopharm. 2000;50(1):47-60. El-Zhry El-Yafi AK, El-Zein H. Technical crystallization for application in pharmaceutical material engineering: Review article. Asian J Res Pharm Sci. 2015;10(4):283-291. Zografi G, Newman A. Introduction to amorphous solid dispersions. Pharm Sci Encyclopedia. 2015. Park JH, Choi HK. Enhancement of solubility and dissolution of cilostazol by solid dispersion technique. Arch Pharm Res. 2015;38(7):1336-1344. Fahr A, Liu X. Drug delivery strategies for poorly water-soluble drugs. Expert Opin Drug Deliv. 2007;4(4):403-416. Patil P, Rao B S, Kulkarni SV, Basavaraj, Surpur C, Ammanage A. Formulation and in vitro evaluation of floating matrix tablets of ofloxacin. Asian J Res Pharm Sci. 2011;1(1):17-22.